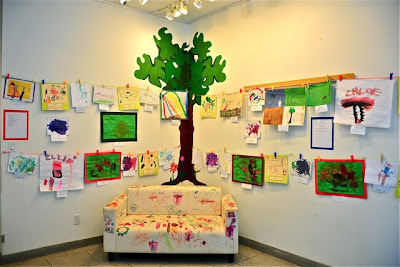 Preschool of the Arts' J. Klaynberg Gallery in Chelsea. There was a ton of green imagination on display in Chelsea over weekend as the Friends of 20th Street Park kicked off its Imagine The Park Kids Art Show at the Preschool of the Arts' J. Klaynberg Gallery at 121 W. 19th. 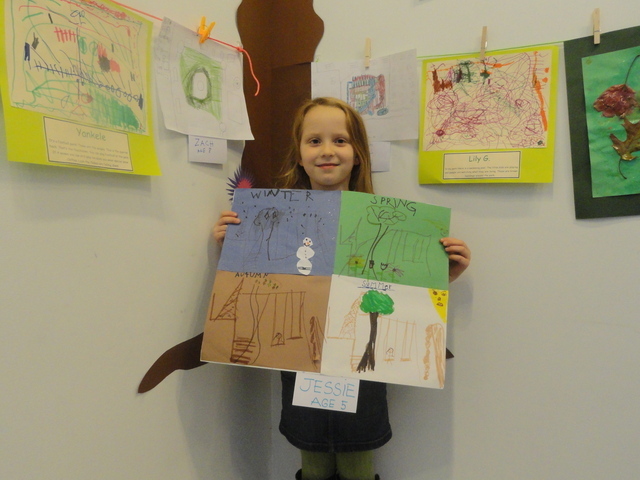 More than 100 hundred hand drawn pictures envisioning their dream park were submitted from kids ages 3 - 12. 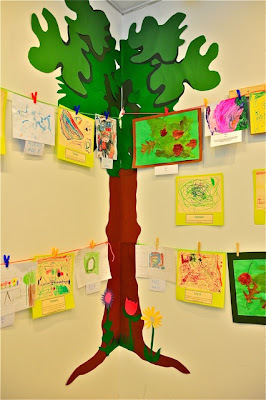 Children drew flowers, trees, waterfalls, rock climbing walls, dog runs, basketball courts, double-decker slides, football fields and lots of swings! The young artists and future city planners were joined by parents, community leaders including representatives from CB 4 and from local civic groups to show their support to transform a vacant city lot Into a neighborhood park. A balloon artist, music, art activities, refreshments and door prizes from local business sponsors made for a memorable event. Hard at work envisioning the future city park at 136 W. 20th Street. An excited artist finds his work on the gallery wall. Where the city sees a vacant lot, these kids see a swimming pool, a football field, or an endless field of flowers. When it came to reimagining the contentious tiny plot at 136 West 20th St. in Chelsea — a vacant lot the Department of Sanitation lot the city hopes to turn into affordable housing, but activists dream will one day be a park — the neighborhood's smallest denizens didn't hold back, according to DNAinfo. In drawings on display at the Preschool of the Arts' J. Klaynberg Gallery Sunday, at 121 W. 19th St., kids from 2 to 12 showed off their own plans for the disputed swath of green area between Sixth and Seventh avenues. A young artist and future green city planner manages to break away for a second from her work for a smile. "My son is playing catch in an empty parking lot, and it'd be nice for him to be able to do it down the street," said Ceci Van Blerkom, 38, a local mother and park advocate. "We used to live in the Village, which is full of parks. We never realized how little park space there really is here," Van Blerkom said. The neighborhood's Community Board 4 ranks among in terms of percentage of open space and for residents' proximity to parks, local leaders have said. 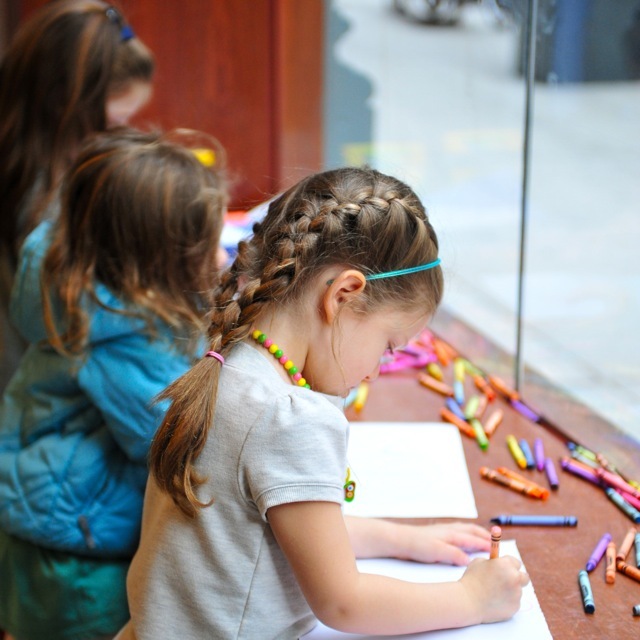 Like most parents who spoke, Van Blerkom said she takes her kids to Madison Square Park or Union Square to play — easily a 15-minute schlep from home. "It's really difficult," said Susie Shapiro, 42, whose daughter Sophie, 4, and son Ben, 7, had submitted designs for the new park. "By the time we get down there, it's already time to go." Shapiro said she hoped the future space would be a place for neighborhood kids to meet one another. "We really need a park."